I had a theory when I was young, it went something like this. Teenagers, are aliens. Everyone starts as a normal human as a child, but then when they reach their teenage years, aliens come down and replace them with alien doubles. The aliens look and sound just like the old person, but is different in every way that matters. This probably has something to do with the relationship between me and my brother when he crossed into adolescence, but no matter. When a person is done being a teenager, the aliens come back and replace the teenage double with one’s adult self. I feel like I’ve finally been replaced, and it’s for the better. I have been home in San Francisco for one month now, and I’ve wrapped myself in a veritable cocoon, seldom venturing out. I am in the process of going through a transformation – or more precisely putting the finishing touches on a transformation that I think already happened. 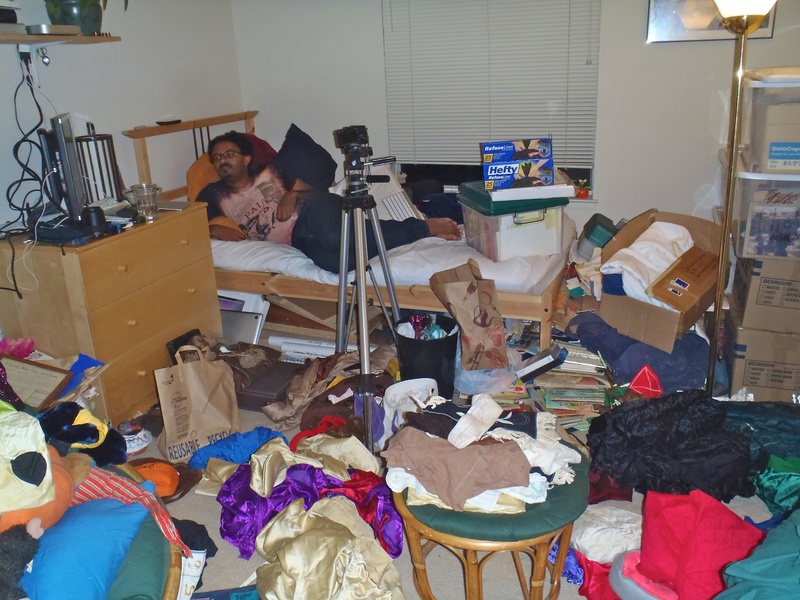 You see, just before I went overseas, me and my dad trekked down to the Los Angeles area to empty a storage container full of my family’s trash and treasures, which we then packed into my room while I was away. This meant that the first sight to greet me, walking into “my room” was floor to ceiling boxes. I wish I had taken a picture early on to adequately describe just how much crap there was. I don’t have such a picture, but here’s a picture of my room TWO WEEKS(!) into the process to give some context. I immediately set about cleaning the mess – if for no other reason than to clear a space on my bed to sleep. I will detail this process in an upcoming post, but that’s not what I’m thinking about now. Last week I picked up the journal I was keeping just before I took my teaching job in Korea. Even though I know it’s mine – I recognize the handwriting, I remember writing many of the exact sentences within – it doesn’t feel like mine. Reading it feels like I’m reading someone else’s thoughts. When I went off to teach, I didn’t feel like an adult, I felt like a really old kid. If I was to talk about myself or my peers, I would have had a hard time even referring to myself as an adult – it just felt…wrong. But now, I don’t feel like a kid, I actually feel like an adult. I honestly thought about quitting the next day, before I actually had to start teaching. I simply couldn’t believe that in three days time I would be in front of a classroom teaching children, when I still felt like a child of sorts myself. That first day teaching came and went – and I still didn’t feel prepared. But bit by bit my confidence grew, and the child in me fell away without me even noticing. I’m not the same person I was when I left, but I feel like I’m more truly myself than I have been for many years. I feel silly, having locked myself away with my memories for the better part of a month. But it really has been a process of letting go. I set myself the goal that everything I keep from my “extended childhood” must fit into one neat box. Everything that can’t fit into that box must be given away, sold away or thrown away. I’m down from more than a dozen to ~3 boxes. This last stretch is killer, and I feel like giving up sometimes, but I won’t, I can’t. I think the end is near, I truly think by the end of this week I can have that one neat box packed, and do away with everything else. By the end of this week I plan to close a big chapter of my life and start something new. Goodbye teenage alien Seth, I wish you well on your home planet. This entry was posted in Personal and tagged uncluttering. Bookmark the permalink.